FORT WORTH, Texas (Oct. 10, 2017) – With a heroic performance in his first career start, directing the Cyclones to a stunning 38-31 upset at No. 3 Oklahoma, Iowa State senior Kyle Kempt was voted the Davey O’Brien Quarterback of the Week for week six of the college football season. Kempt completed 18 of 24 passes for 343 yards and three touchdowns as Iowa State snapped an 18-game series losing streak to the Sooners. It was ISU’s first win in Norman, Okla., since 1990 and was the program’s first-ever victory over an Associated Press top-5 opponent on the road. The Big 12 Offensive Player of the Week tossed a 25-yard touchdown pass with 2:19 left to lift the Cyclones to the victory. Iowa State had a 14-point deficit in the first half and trailed 24-13 at halftime. Prior to Saturday, Kempt had attempted two career passes. 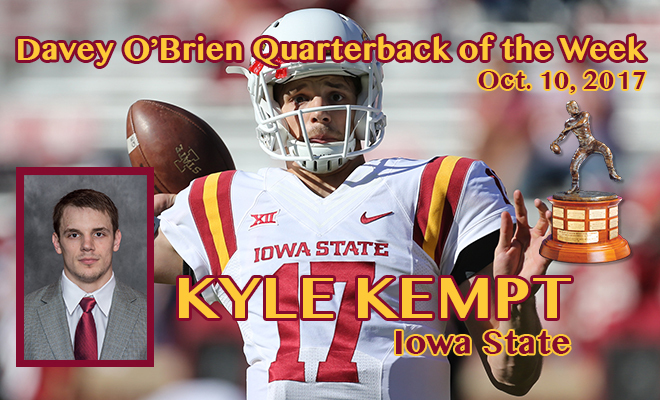 Kempt is the first Iowa State quarterback ever to win the Davey O’Brien weekly award. He is the third Big 12 player honored this season, joining Oklahoma’s Baker Mayfield and TCU’s Kenny Hill. The other “Great 8” quarterbacks in week six were: Zach Abey of Navy, Buffalo’s Drew Anderson, Sam Ehlinger of Texas, Memphis’ Riley Ferguson, McKenzie Milton of UCF, Arizona’s Khalil Tate and Jon Wassink of Western Michigan.